The 19th century history of ceramic production in Worcester was a busy and, at times, rather an incestuous one. The original concern started by Dr Wall in the early 1750s went through several changes of hands in the late eighteenth and early nineteenth century. In 1783, Thomas Flight (a banker rather than a potter) was at the helm. 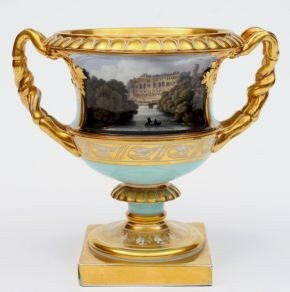 By 1792, he went into partnership to form Flight & Barr, in 1804 Barr, Flight & Barr and then in 1813 Flight Barr & Barr, which continued up until 1840 – a complicated series of ownerships, but one which produced the highest quality Regency porcelain for domestic and foreign royalty and the nobility, culminating in a service made for King William IV. Fit for nobility: Flight Barr & Barr teawares, circa 1820. Porcelain from Worcester during this period was instantly recognisable by its sumptuous use of gilding and highly skilled enamelling from the likes of master artists like Thomas Baxter who painted feather and shells, William Billingsley whose forte was flowers and any number of other artists who specialised in topographical views. Meanwhile, across town Robert Chamberlain, who had left the Worcester factory shortly after Thomas Flight took control, started his own rival concern in 1788. With skills learned as an apprentice in Dr Wall's concern, he was ideally placed to supply the burgeoning middle classes with their tea and table wares. His early products being unmarked, he gained a good reputation latterly for the more decorative trinkets such as baskets, bough pots, pastille burners and figures, but was not too proud to also produce whistles, buttons and even door furniture. Eventually his wide ranging and quality product allowed him the delicious irony of taking control in 1840 of the rival concern. However, in turn, one of Chamberlain's former employees, WH Kerr took over leadership of the ailing concern in 1852 after it failed to gain any acclaim at the Great Exhibition. 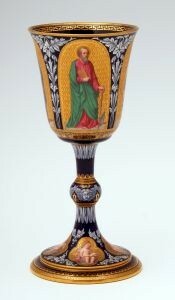 goblet of Exhibition quality - just a little too late. 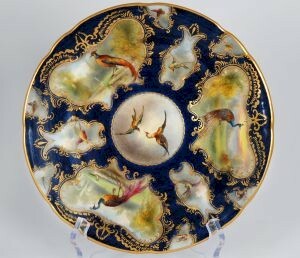 In partnership with RW Binns, he traded for a further ten years until retirement in 1862 and the formation of the Royal Porcelain Works. Rather than being known as an astute businessman, Binns was the individual who catalogued, researched the company's collection of porcelain and established the Worcester porcelain museum. A Grainger & Co Worcester plate. 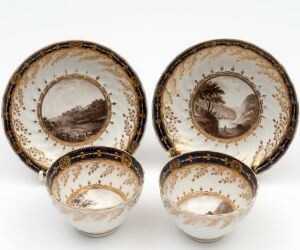 Two further former employees of the Chamberlain factory in Worcester, Thomas Grainger and John Wood also left to form the rival firm of Grainger & Co (making a total of three active concerns in the city), which made its first porcelain in 1806. Initially useful tea and table wares were a staple, but the range extended to include decorative mugs and vases that had quite a florid rococo look to them, some finely painted vases and baskets, presumably in direct competition with Flight, Barr & Barr and a small number of figures and animals. Grainger & Co continued as an independent concern until it was subsumed, in 1889, into the Royal Porcelain Works, although somewhat curiously it did still produce porcelain under its own name for some time afterwards.